Yesterday I wrote a post about the most dangerous crosswalk in Fort McMurray, and the best part was that it inspired a lot of discussion. I watched as people on various Facebook pages argued about whether other crosswalks were really the most dangerous, and if I had chosen the wrong one. I watched as people shared stories of their close calls at intersections and crosswalks all over the community. I watched as people tried to suss out who is really to blame for these incidents, and decide who in the trifecta of responsibility (driver, pedestrian, government) was truly the most responsible. In the end what I noted most, though, was that this issue has some relevance. It's "got legs", as we say, as it didn't take much to get people talking about it - which means this is an issue that matters in our community, and it has been noticed. It means, I think, that we have a problem. In reality we all have responsibility, from drivers to pedestrians to governments. It's one of those issues where we must be careful about pointing fingers, because there are fingers pointing right back at each of us on this one. Part of being a community means looking out for each other. Instead of trying to assign blame we need to work on accepting responsibility, considering our own actions and contributions and how we can improve the situation. I will leave you with this photo from a recent incident on Thickwood Boulevard. 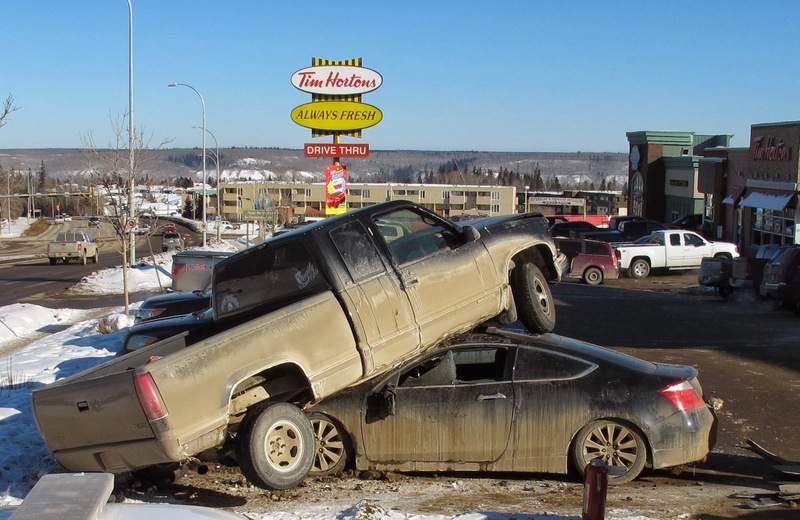 Now, forget the jokes about being in a real hurry for his Tim Horton's, and the comments about the wisdom of the driver in question giving a radio interview after the incident (a statement I am sure the RCMP will find interesting, given that the driver acknowledges he was speeding despite his protestations of other factors). This picture just isn't funny, because had there been someone in this car or in the parking lot the ending could have been much different - and a tragedy. It's a reminder of why we need to talk about vehicle safety, both in crosswalks and out of them. This might seem funny now, but had there been a person in that car, or in the way? Just not funny. Not funny at all, and nor is the issue of how we protect each other - because that is part of what being a community is about. While there might be other crosswalks that could be deemed the "most dangerous" it seems that the "most dangerous" location is a moving target, as this week the most dangerous location was a parking lot that suddenly became the spot of a potential tragedy. Which area is the "most dangerous" matters far less than making sure every location is the least dangerous we can make it - and we all have a role to play in that.